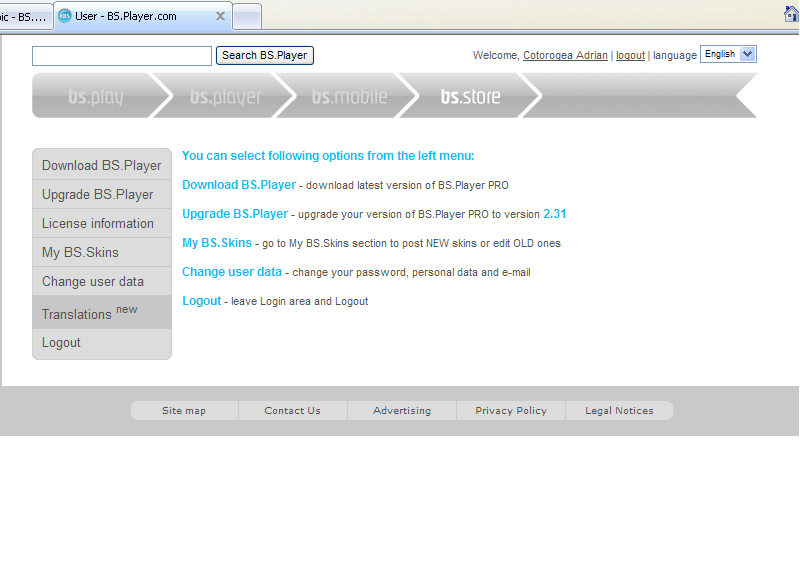 BS.Player translators now have the option to upload their translations directly from User Area. New button will be visible - Translations - only for translators. You can download latest version of reference file (english.lng) and lang changes.txt there and upload your translation for your language. Select your language file from your hard disk (only .lng is accepted), and the language of the translation. Your newer translations will replace older versions, and we will automatically fetch these translations into BS.Player installation and this means BS.Player will always have all the latest translations for all languages. If you wish so, you can still post your translations on forum. Translation file must be in UTF-8 encoding, otherwise it will not be displayed correctly to all users. Am I blind or there's some problem? Maybe I've not been added to the translators group? Anyhow, as uploading does not repair the present situation that users will in fact still always lag at least one language-version behind. Though the latest available language-files can be included in this manner, fully up-to-date language-files can never be included in the installation-package, unless the present procedure of not making available changes-file and reference-English-file in advance is changed (and/or in case there have been no changes in language between the versions). And even if henceforth these files are made available prior to the new installation-package, translaters will not be able to check if their translations fit in the space reserved, whereas there will also be translators who do not resp. cannot always submit an updated translation in time before the new exe-package appears. So, (apart from uploading when this becomes possible) I will also continue to place my translations in the forum, thus enabling users to bring their most recent BS.Player version up-to-date. "Since I have not yet sent you my Italian translation I wanted to try this new upload method"
"Anyhow, as uploading does not repair the present situation that users will in fact still always lag at least one language-version behind. Though the latest available language-files can be included in this manner, fully up-to-date language-files can never be included in the installation-package"
"I will also continue to place my translations in the forum, thus enabling users to bring their most recent BS.Player version up-to-date. " @BSPeter: We will publish beta version at least 2 week prior to final version, we believe this is enough time to translate, especially because only few lines are added or modified from version to version. And when the final is out and the translator notices that the spacing is wrong, he/she can re upload translations at any time - which will replace existing translation and will be included in the installation file. This way we can ensure that any translation uploaded will be quickly included in the installation, whether they be uploaded at time of beta relase or anytime later. And sure, by all means, post your translation on forum also - if you choose to do so. @both: We fixed your license and you should be able to upload your translations now. Cool! :D I tried it but I get "Warning: mkdir() [function.mkdir]: File exists in /var/www/bsplayer.com/pathtofile/user.php on line 536" (I guess you need to chmod, don't forget to chmod again after it's uploaded else hackers can nuke it). @mihhkel: Your translators license is ok, and you should see the button Translation. Try to login to User area with the data from your license. (you might have more than one account). @MRAc: You have uploaded the language file in the evening, but we already compiled the installer before that. Do not worry, your translation will be used in the first next version of BS.Player. "Select your language file from your hard disk (only .lng is accepted), and the language of the translation." Translators, please do not upload zipped or rared language files, as there is no need for it, because these are small files anyway. Upload only plain text .lng file. There are only "Download BS.Player", "Upgrade BS.Player", "License information" (which says "License valid until: 10 Sep 2004" :roll: ), "My BS.Skins", "Change user data", "Logout". I don't think I have more than one account, but how can I check that?